Most of the Surveillance systems and CCTV camera uses rechargeable 9 volt battery. This simple Battery Monitor can be hooked to the 9 V battery so that it indicates the voltage in the battery through visual indications. When the Test switch is pressed, the Bicolour LED lights as Green if the battery voltage is above 9V (fully charged) , it lights Yellow when the voltage is between 7.5V and 9V, ( moderate charge ) and lights Red when the battery voltage is below 7.5 ( needs charging ). 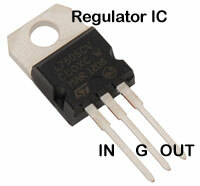 Most of the CMOS circuits need a well regulated power supply for proper working. Regulated power supply is the DC source that gives constant Voltage and Current in its output irrespective of the input changes. Various types of power regulation methods are available which depends on the use and type of the circuit. Here explains three Regulated power supply designs. Inrush current at power on or power resumption after a power failure is the major cause of data loss and errors in Micro controller based electronic circuits. This circuit gives a time delay of 2 minutes to stabilize the power before the device switches on. This circuit protects home appliances from low voltage. When the voltage in the AC lines drop below the normal voltage, the circuit cut off power to the appliance and keep it off till the normal voltage resumes. This gadget is useful to protect appliances like Fridge which may over heat if the line voltage drops below 180 volts. Voltage drop also increases the current consumption in Fridge due to over stress on the compressor.